Smartphone cameras are improving in almost every way, and one of the major stumbling blocks of the shooter in your pocket may soon be fixed with Oppo's brand new tech. 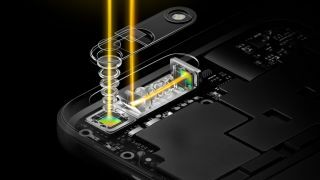 Oppo has just revealed a phone camera that can zoom into an image five times without any loss of quality. It sounds a little too good to be true, so we headed down to try it out while at Mobile World Congress 2017. The good news is, it works. Oppo hasn’t included this tech in a new smartphone release yet. Instead it’s just being displayed on prototype devices that are restricted to only the camera. There's no option of shooting video on these phones, but you can zoom in either one or five times. The phone pictured in this article will not be released by Oppo, but the tech should soon appear in phone releases from the company. Lossless zoom has been possible in phone cameras before - the Nokia Lumia 1020 could do 3x zoom back in 2013 - but this is the first time it has been pushed up to 5x zoom. That means you can zoom in that little bit further and get a great shot. Practically this can be very useful when you're far from your subject - and when using the Oppo tech there was no noticeable loss of quality when zooming. It’s genuinely breathtaking when you compare these shots to other smartphone cameras on the market. For example, we tried the same shot with the newly launched Huawei P10 and there was a very clear noticeable loss in quality when trying 5x zoom. We weren’t allowed to take photos from the Oppo device, but you can see shots of how the image looked in the gallery just above. The Oppo tech uses a periscope-style structure to beat the competition when it comes to lossless zoom. This diverts light through a prism and into a telephoto lens that’s set at a 90-degree angle to a rear-facing wide-angle lens. That light shift is how Oppo has been able to achieve lossless zoom without sacrificing the thinness of a phone. Bear in mind, the photos taken on this demo are very well lit. The Oppo booth was set up to showcase this tech in the best case scenario. This won't work as well when trying to take darker or night time shots. The company has been working on this tech for over a year now and it includes over 50 different modules working together to allow for this level of lossless zoom. Oppo hasn't shared any more details on what those modules are, but we know the sensor is only 5.7mm thick, so will be able to fit into the back of a phone without creating a huge camera bump. Because zooming in is likely to make your images quite blurry, Oppo has also spent a lot of time working on stabilization for photography. Here it's supposedly 40% better than on previous Oppo phones, but we didn’t think the stabilization was particularly good when using it on the floor. If there's a slight shake in your hand you'll end up with a blurry image, and that's a bit of a shame. That said, if you shake when zooming on any other phone camera you'll end up with the same problem anyway. This is part of what Oppo will need to work on further if it plans to bring this lossless zoom tech to the market anytime soon. Considering some flagship manufacturers are currently focusing on upping the size of camera sensors and not working on areas such as stabilization and zoom, this is a big step towards a great new feature in our smartphone cameras. This technology is exclusive to Oppo at the moment, but a similar tech could be applied by other companies to their smartphone snappers in the future, or Oppo may even license the idea out to other firms to use in their phones. Improving such a vital feature of camera technology on smartphones just means we’re another step closer to being able to see phone photography compete with fully fledged cameras. Whether the next Oppo phone will be capable of that task remains to be seen, but the new 5x lossless zoom tech may be one of the biggest highlights of whatever flagship phone Oppo releases next.